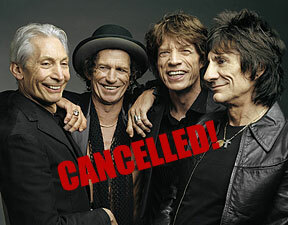 The Rolling Stones canceled their Nov. 22 concert at Aloha Stadium. The famous rock group was forced to reschedule several other concerts on its "A Bigger Bang" world tour to allow singer Mick Jagger to recover from throat problems. The band was advised to take four days off. The Los Angeles concert originally scheduled for Nov. 18 has been moved to Nov. 22, the date the band was supposed to play here. Aloha Stadium officials said this morning that they had not been notified of the change. The Stones said fans who bought tickets to the Honolulu concert can get refunds through Nov. 22. from wherever they purchased them. The state Department of Transportation is advising Ewa Plain residents to expect increased air traffic and possible accompanying noise through Friday. The airport will conduct airfield maintenance work on Runway 4L-22R between 6 p.m. and 3 a.m., and reroute incoming aircraft to Runway 8L-26R, thus increasing air traffic over the Ewa Plain. The Department of Land and Natural Resources will wait until next week to start a sand replenishment project at Kuhio Beach, the department announced yesterday. Weather forecasts include south swells and Kona winds through the rest of this week. "We're being safe -- we don't want to do anything during adverse conditions that could jeopardize equipment and further delay operations," DLNR Director Peter Young said in a news release. Contractor American Marine Corp. has removed its barge-mounted sand-pumping equipment and will bring it back when the weather is calmer, Young said. The company will continue work this week to prepare its on-the-beach staging area for the work, the department release said. The month-long project is to pump 10,000 cubic yards of sand from 2,000 feet offshore and apply it to widen Kuhio Beach. For the first time since the Oct. 15 earthquakes, the state is testing its emergency alert system at 11:45 a.m. today. The monthly test will include sirens, television and radio announcements. It is conducted on the first workday of each month. More than 14,000 gallons of untreated sewage spilled last night from the Kailua Treatment Plant when a piece of equipment was clogged. The sewage spilled at about 8:50 p.m. onto the plant's driveway at 95 Kaneohe Bay Drive and entered a drainage system on the grounds of the plant. The area was disinfected. A new bar screen became clogged and caused incoming wastewater to backup and overflow. Peter H. Nozaki of Honolulu was promoted to the rank of Eagle Scout by the Aloha Council of the Boy Scouts of America. He is chartered by St. Anthony's Church in Kailua, and belongs to Unit 223. Jean H. Hankin, professor and researcher emeritus in the epidemiology program at the Cancer Research Center of Hawaii and professor of public health at the University of Hawaii, received the Edna and Robert Langholz International Nutrition Award. The American Dietetic Association Foundation presented the award, which carries a $25,000 honorarium. Hankin is an internationally recognized authority in quantifying the role of diet in chronic diseases. The American Resort Development Association - Hawaii donated $25,000 to establish the Steve Hirano Memorial Scholarship Award at Hawaii Pacific University. The scholarship will go toward the study of the timeshare industry in relation to the travel industry. Hirano was a longtime lobbyist for the ARDA and dedicated to building the timeshare industry in Hawaii. Police were looking for two men who robbed another man at gunpoint in Makiki early Monday. Police said that between 2:45 and 3 a.m., a 20-year-old man was parking his sport utility vehicle in his condo parking lot at Victoria and Green streets when he was jumped by two other men. Police said the two men hit the victim repeatedly and demanded the keys to his roommate's motorcycle. One of the suspects pointed a gun at the victim and threatened him, police said. Once the suspects had the motorcycle key, they forced the victim back into his SUV and drove him around the block, police said. They then went back to the condo parking lot, at which time the armed suspect jumped out and stole the motorcycle, police said. Police describe the armed suspect as being in his early 30s, 5-foot-6, about 160-180 pounds, with short black hair. He was wearing a red T-shirt and blue shorts. The other suspect was described as being in his late 20s, 5-foot-8 to 5-foot-10, and weighing about 180 pounds. He was wearing a white baseball cap, a white T-shirt, a backpack and blue denim shorts. Kona police arrested a 38-year-old Kailua-Kona man after finding what appeared to be a hand grenade on him and evacuated a parking area where it was found and a nearby apartment building. Police responded to an early morning call yesterday for help at an apartment complex on Mamalahoa Highway in Honalo. A 42-year-old woman told responding officers her estranged boyfriend had at least two live hand grenades. Police took the man into custody and found an item that looked like a hand grenade in the woman's car, which was parked at the apartment complex. Police evacuated the parking area and apartment building at 2 a.m. yesterday. Hawaii County Civil Defense assisted with the evacuation and opened Kailua Gymnasium as a shelter. A Schofield Barracks explosive ordnance disposal unit went to the scene and identified the item as a nonlethal live grenade, which emits a chemical similar to tear gas, used for riot control. The man was arrested and is being held at the Kona police cellblock pending further investigation. Police were looking for two men who robbed another man at gunpoint in Makiki early yesterday. Police said that between 2:45 and 3 a.m. a 20-year-old man was parking his sport utility vehicle in his condo parking lot at Victoria and Green streets when he was jumped by two other men. They then went back to the condo parking lot, at which time the armed suspect jumped out and stole the motorcycle, police said. The other suspect fled on foot. Police describe the armed suspect as being in his early 30s, 5-foot-6, about 160-180 pounds, with short black hair. He was wearing a red T-shirt and blue shorts. The other suspect was described as being in his late 20s, 5-foot-8 to 5-foot-10, and weighing about 180 pounds. Police arrested a 36-year-old woman who allegedly tried to buy fast food with fake money. Police said the woman pulled into the drive-through lane of the new Wendy's restaurant at Moanalua Road and Aiea Heights Drive at about 11:50 p.m. last night and ordered food. She tried to pay for the food with a counterfeit $100 bill, police said. Police arrested the woman for investigation of first-degree forgery.